There have been some questions about spelling and spell checking in the OWA. Update – Firefox is now in version 26 and everything prior is considered dangerous and insecure. There are some things which will only work in Firefox on campus and some things which will work everywhere but Firefox. The best advice I can give is to try the different browsers you have on hand before admitting defeat. There are also some email related settings that will only work in a recent version of IE with the S/MIME controls active, but if you don’t have those options, you probably won’t realize you’re missing any. I am verifying user reports here that the spell check controls are missing if you are using Firefox to access the OWA.? This has been confirmed in Firefox versions 3.6.? and 10 both. 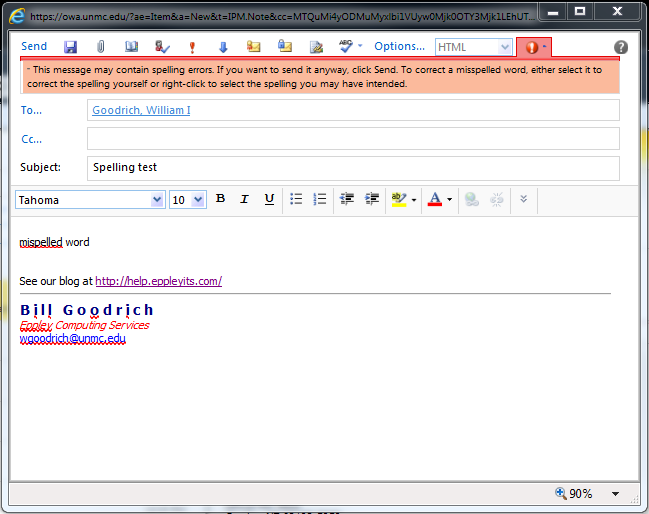 However, the default settings are to automatically check your email for spelling, so this may not be a problem to you. I don’t believe it spell checks your subject line either way. If someone finds any different let me know. These options are all fun but since the default is to scan for spelling anyway, I am turning them all back off on my machine because I don’t need any extra junk.